I had a lovely offer through my e-mail recently. Most offers from PR’s that I accept are centred around my children or gifts, but every so often, one comes along that I really can’t resist taking the opportunity to accept for myself. I was given a document with an option to pick three items that I liked from in order of preference. I made a quick decision that this campaign was tailored just for me (ok don’t burst my bubble) and eagerly returned my choices to the PR. I opened my pack to the feel of a lovely designer dust bag covering whatever contents there were inside. I was immediately impressed and impatient to see what lovely creation that I had been sent. I had been sent the lovely Kate Benjamin Black Leather Studded Duffel Bag (opens link in new window) and I knew I was in heaven. I was surprised to see that all three of my choices were from the Kate Benjamin range, so I must have been destined to receive one of her fabulous designs. Now down to the nitty gritty that all bag lovers want to know. I have to say I was delighted to receive my first choice from the sheet, and was able to really appreciate the bag. 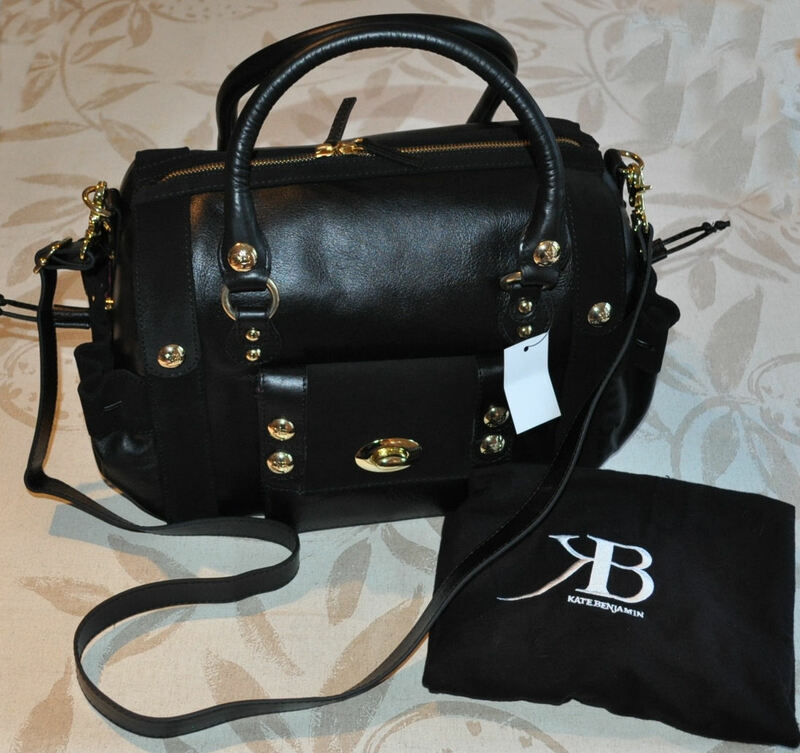 The Kate Benjamin Black Leather Studded Duffel Bag retails for £175.00 and the attention to detail impresses. The first thing that struck me was the wonderful smell that emanates from a new leather bag. The bag is a mixture of suede and leather and with the most exquisite gilt buttons, hoops and fastenings. Can you tell I am completely besotted by this bag? Maybe this incredible feeling of elation at a lovely item is something that only an appreciator of bags can understand. I know that my sister in law, who is a handbag connoisseur is going to be green with envy when she spots it. Now for the picture of my real, actual bag with its dust bag. I so love this. 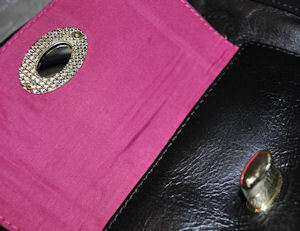 I’ve shown the inside lining which has a lovely shade of fuchsia and is beautifully finished throughout. The body strap which is detachable makes it the prefect bag for me. When I am shopping or out with the boys, I like to have my hands free to carry other things. The outer bag is 100% Leather and the gorgeous Inner is 100% Cotton. I can see I am going to get a lot of use out of this lovely, lovely piece of perfection. Accessories Direct also have gorgeous jewellery, hats, purses, umbrellas, fascinators, slippers, gloves, wallets, scarves, gifts for all. I actually love this Linden French Multi Striped Bunny Rabbit, and I wish we had someone in the family with a child young enough to give it to. To go with my post reviewing this fabulous bag, Accessories Direct have allowed me to give my readers a huge 20% off non-sale items from the website. All you have to do to get this discount is to enter this exclusive code when you buy. The discount code is valid until 9th December 2011 and I would recommend buying early to avoid the Christmas post rush. And if you sneak over to their website (opens link in new window) you will see they also have a Facebook Promotion going for the 12 Days of Christmas which looks fabulous. Disclaimer: I was provided with the Kate Benjamin Black Leather Studded Duffel Bag by Accessories Direct to review. « Are you supporting the strike? Here’s why I am not. Thanks for finally writing about >My Kate Benjamin Black Leather Studded Duffel Bag – and a 20% Discount Code for Accessories Direct <Liked it! Hasn’t it just. I think I have definitely had the highlight of my Xmas with this bag. I used to get those letters too. Now I get some lovely real offers mixed in with them. I’m a lucky lady this week with this bag. Hiya, I meant to phone last week, can I have the bag? I’m sure you don’t really need it. Nope, this little beauty is not heading to your house lady. It’s mine, all mine… Phone over the weekend, littlest ill so not going very far.